Why is rail-related suicide an occupational health and safety (OHS) issue? 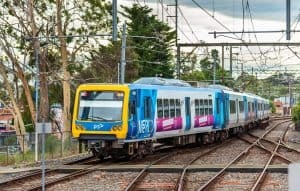 I looked into the issue of rail-related suicide when writing an OHS chapter for the Metro Trains Melbourne’s (MTM) bid for a franchise renewal for running trains on the metropolitan network. Each rail-related suicide, MTM describes these as trespasser suicides, creates major work-related psychological trauma for the train drivers as well as grief for the families of the deceased. These incidents have secondary impacts on the rail workers who need to clean the trains which are taken out of service after each incident and driven to the nearest biowash, as well as those MTM staff, and emergency service workers, who were required to attend the scene. There is also massive harm, pain and cost to those whose suicide attempts fail to result in death, and those who will care for those who are now disabled. Addressing the hazard of rail-related suicides needs a new and broader discussion; one which must involve a broad, enlightened occupational health and safety approach. In fact there are currently 16 readers online and a total of 16610 readers this month!